How does so much trash end up in the middle of the ocean? directly. Trash is often accidentally dumped directly into the ocean from shore or, more often, from ships. Container ships also lose tons of cargo in the ocean every year, as they are tossed and turned by hazardous high seas and unsecured containers slip overboard. Use our activity “Mapping Ocean Currents” to understand how a 1992 cargo ship spill ended up dumping nearly 92,000 rubber ducks into the Pacific Ocean. indirectly. Most marine debris is actually land-based, and ends up in the ocean indirectly. “Rainwater ushers mismanaged waste from land into local waterways, which feed into larger tributaries and rivers, which in turn empty into oceans. In this way, plastic from far inland can travel many miles to the coastline.” According to some sources, just ten rivers contribute 95% of river-based ocean pollution. Most ocean plastic is labeled “mismanaged plastic waste.” What is mismanaged plastic waste? Manila, Philippines, for example, is the urban area addressed in the Nat Geo article. Manila “has a metropolitan garbage-collection system that stretches across 17 separate local governments—a source of chaos and inefficiency. In 2004 the region was already running out of land to safely dump garbage. The shortage of landfill space, and thus the crisis, continues today.” The Pasig River, which runs through Manila and feeds Manila Bay, is one of the most polluted waterways on Earth. ocean currents and gyres. The ocean is a network of currents, cycling nutrients and energy around the world. It can cycle plastic, too. Take a look at our map for a lovely outline of ocean currents. Tides and currents transport debris to ocean gyres. Gyres are powerful currents that rotate in enormous circles. 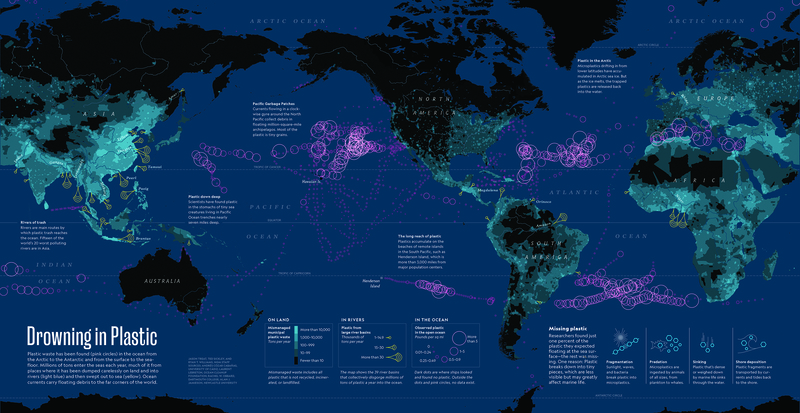 Waste that is caught in a gyre spins in relatively stable areas, known as ocean “garbage patches.” Take a look at our beautiful map of the ugly problem of the five gyres. A huge amount of food packaging is single-use plastic. Make smart decisions about buying products with excess packaging—try to avoid those cute individual containers held within larger containers. Think globally, act locally. See how your local community is relying on single-use plastic, and try to address that specific issue. How permeable are the storm drains in your neighborhood? Do they effectively filter out large plastic trash? Vote. Support local, state, and federal laws that encourage conservation and punish pollution. Support local, state, and federal representatives who make protecting the environment a part of their platform. Contact your local officials to ask how they are working to reduce our reliance on plastics, and help them come up with local solutions to local problems. There are many issues that we as a whole can do to take of this planet. Starting with plastic bags and recycling. Get rid of all these plastic bags people dispose anywhere they feel necessary and make people recycle, hand out the recycling bins at all addresses in America. It’s very important for us all to be on board.